This section of the Parkway is popular for short drives from Asheville, and provides access to many recreation destinations along its length. Mount Pisgah itself is an ever-popular spot and the Pisgah Inn attracts thousands of visitors each year. You'll be within the Pisgah National Forest, climbing up the Pisgah Ledge, all along this route. The Pisgah Inn as seen from the summit of Mount Pisgah, with Pisgah National Forest beyond. This is a very popular section for bicyclists, so be extra careful when driving. You'll encounter many tunnels here, including the longest on the parkway - the Pine Mountain tunnel at 1,434 feet and the Triple Tunnels of Ferrin Knob. Several National Forest recreation areas are accessible within a short drive from this stretch of the Parkway - Bent Creek, Mills River, Davidson River, Shining Rock Wilderness, Graveyard Fields and the Black Balsam area. 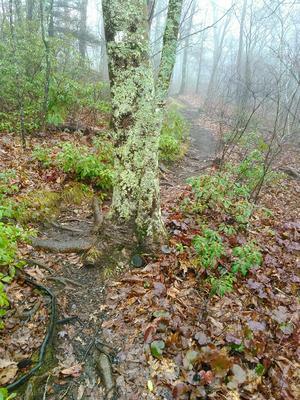 The stretch of the Montains to Sea Trail between the Looking Glass Rock overlook and the Bridges Camp Gap trail in dense fog. The Mountains to Sea and Shut-In trails follow this section of the Parkway closely along its northern end near Asheville. The trail can be accessed at several overlooks and points along the motor road, making for some nice day hiking opportunities. Look for the small posts with the white circle and hiker icon as you drive to explore this trail. Longer trails connecting into the Bent Creek and Mills River area join with the Mountains to Sea Trail and/or the Parkway directly as well. 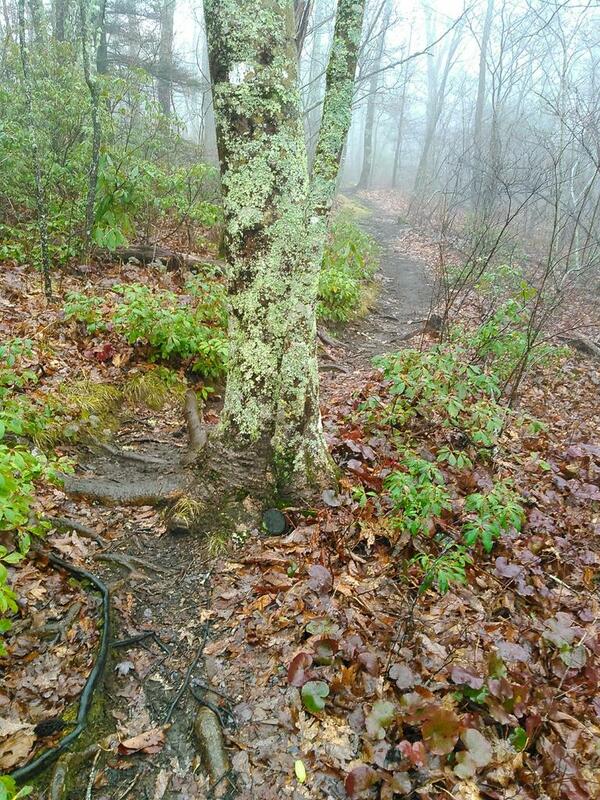 Mount Pisgah is a very popular recreation area on this section of the Parkway. It gets its own trailhead page with all the details. Graveyard Fields is another popular recreation area on this section of the Parkway, lying mostly within the Pisgah National Forest. It gets its own trailhead page with all the details. The Mount Pisgah Campground, across the road from the Pisgah Inn, is open from May to October (dates are an estimate - check weather for parkway closings in early spring/late fall). It has flush toilets, an amphitheater, a camp store, and it's at a beautiful high elevation setting within view and hiking distance of Mt. Pisgah's summit. Cool nights persist throughout the summer, and daytime temperatures rarely climb out of the 70's. There are 41 sites with separate areas for RV's and tents. The Pisgah Inn offers luxury traditional hotel style accommodations and is one of the highest places of lodging on the East Coast. The Inn is located south of Mt. Pisgah beside the Parkway, at the edge of the Pisgah Ridge. 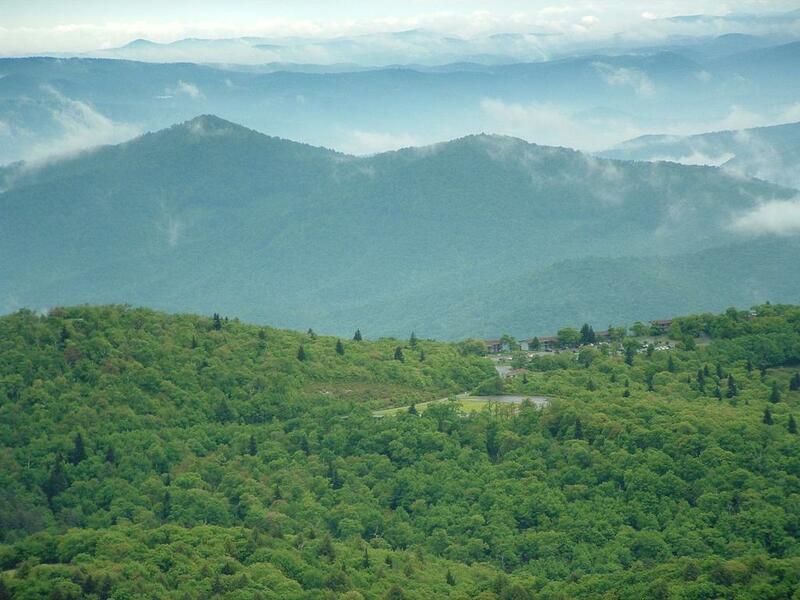 Views off the ridge of the Pisgah National Forest and beyond can be seen from the Inn. Boasting a spectacular view, the Inn also has a great restaurant for fueling up before or after long hikes. Be sure to visit the gift shop for items related to the area including maps, guide books, and souvenirs. Reservations are recommended and can be obtained on the Pisgah Inn's web site.